For the second year in a row the Cleveland Cavaliers selected a Canadian born player with the first overall selection in the NBA Draft by picking Kansas small forward Andrew Wiggins. Last year’s G.M. Chris Grant shocked everybody by taking Anthony Bennett. This year the pick of Wiggins by new G.M. 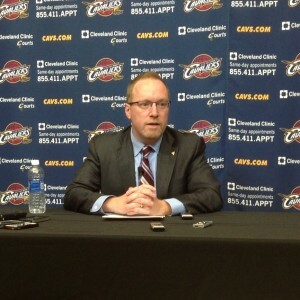 David Griffin does not come as a surprise. With the foot injury and surgery to Kansas center Joel Embiid, basketball executives figured Griffin would pick between Duke’s Jabari Parker and Wiggins and he did, with Wiggins being the choice. Small Forward – 6′-8″ – 200lbs – Age – 19 – Kansas – FR. An athletic freak! His dad played in the NBA and his mom won medals in track in the Olympics for Canada, so his DNA is scary good. When you combine his 6’8 frame, 7-foot wing span and a 44 inch vertical jump, it’s crazy what he can do athletically on the court. His coach at Kansas Bill Self said he has the quickest second jump he’s ever seen, meaning he has the ability to bounce up and down like a pogo stick on the offensive boards and beat guys to the rebound for easy put backs. His transition game is above average. Imagine him filling the lanes on a fast break, getting from one end of the floor to the other and throwing down a tomahawk dunk! He already knows how to play defense and wants to. How many college kids can you say that about? He uses that great athletic ability on the defensive end to guard 2’s, 3’s and some 4’s. So he’s ready to contribute right away on the defensive side of the ball. Shoots it well from the free throw line and his jump shot is good, not a great. His pull up “J’ is solid, as is his intermediate jumper and he has decent range. Penetrates well, has a very quick first step and the alley-oop out of bounds play is tailor made for him. High character kid and a student of the game. Must get stronger and add a few pounds to his frame. His jump shot and his overall offensive game needs to be more consistent. He can get lost in the shuffle out on the court at times because he needs to be more aggressive. Some teams are concerned that he’s too passive. That he doesn’t have that killer instinct or alpha dog mentality. He needs to work on his ball handling which will allow him to attack the rim more in the half court set and make him a better passer. Going left off the dribble is a definite weakness and with his athletic ability he should finish better around the rim. But that should come when he gets stronger. Has good form on his jumper, but it needs to be more consistent, especially from beyond the arc. Reminds me of a taller version of one of the best two-way players I’ve ever seen in the NBA, Sidney Moncrief. He will need to become more consistent, aggressive and attack more on offense if he wants to reach that superstar level. But he has arguably the most upside/potential of anyone in this draft because of his athleticism, ability to play three positions, he already plays defense, is a hard worker, with a high basketball IQ and on top of all that is a good kid who will take well to coaching. Wiggins is my favorite player in this draft and his coach at Kansas Bill Self told me he’s going to be a “Stud” in the NBA! Joel Embiid was the pick in my first mock draft, then he needed foot surgery. 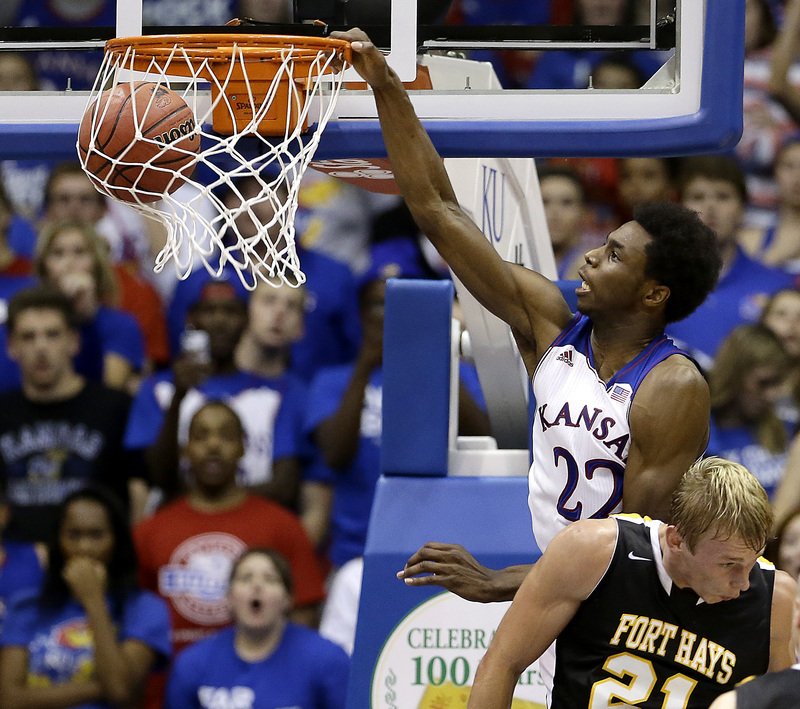 Andrew Wiggins was my choice in Mock Draft 2.0. Now, if the Cavs decide to keep the pick and not trade it, as there is some intel out there that they could make a deal. But if they don’t, and after going back and listening to G.M. David Griffin’s comments from May 13th as well as with the hiring of David Blatt as head coach and LeBron James opting out early to be a free agent, I have changed my mind again and went with Parker as the Cavs pick. I personally have always wanted and still want Wiggins. However with LBJ as a free agent, Griff as an offensive G.M., the Cavs may feel the need to win right away and Parker gives you that best chance because his body is far more developed than Wiggins at this point and he’s more polished and potent offensively right now than Wiggins. He has an extremely high basketball IQ and Parker is also more of a catch and shoot guy than Wiggins, and with two ball-dominate guards in Kyrie and Dion, Parker looks to be the better fit. So by the slimmest of margins, and even though I think Wiggins has more upside in a few years, I’ll say the Cavs take Parker. The good thing here is, with either player, the Cavs are going to be a better team and fill a major need. Not bad for a team who before the lottery was scheduled to pick 9th! After taking Parker with the first pick to provide offense from day one, the Cavs need to add defense to David Blatt’s team. So they take a 22-year old true center who is all about defense at this point in his career from what I’ve read and seen on youtube. He’ll give the Cavaliers a low post defender who will protect the rim and rebound. He’s very raw offensively, but the Cavs won’t care and need some depth at center with Anderson Varejao in the final year of his contract. Also in play here could be Russian center Artem Klimenko. A 7’1 – 228 center with a 7’4 wing span and a 9’4 standing reach. I’ve got to believe that David Blatt knows of him and may have some say in taking Klimenko. 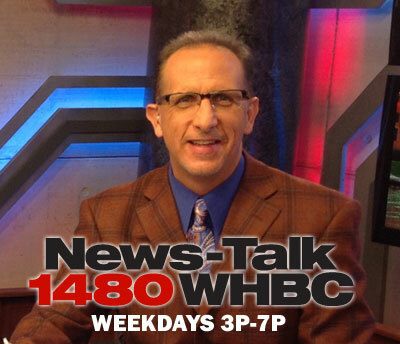 FoxSportsOhio.com NBA writer Sam Amico and I chewing the fat over what the Cavaliers are going to do in the NBA Draft as well as our thoughts on new coach David Blatt and where LeBron might end up. Cavs G.M. 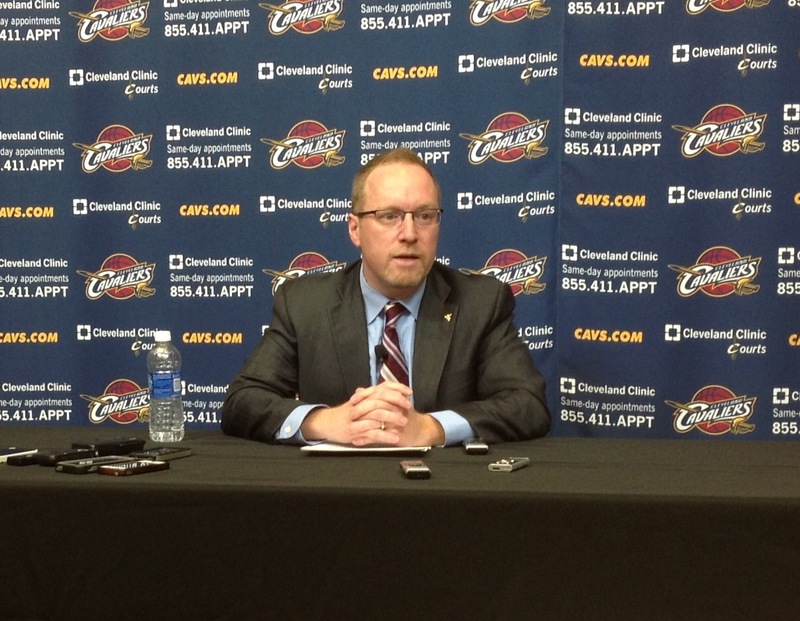 David Griffin told us he didn’t want to follow the trend in a copycat league. That he wanted to zig when everyone else zags in the NBA as he was searching for his next head coach. Griff did just that, surprising a lot of people and making NBA history in hiring David Blatt from Europe’s Maccabi Tel Aviv championship team. So trying to figure out which direction Griffin will go with the number #1 pick in Thursday’s NBA Draft could be just as tricky. With Joel Embiid out now at least 4 to 6 months after having surgery, where he had two screws inserted into his fractured right foot, I think it’s safe to say that the Cavs, if they keep the number #1 pick, will choose between Andrew Wiggins and Jabari Parker. But which one is the big question? Either player would be a welcomed addition at small forward for the Cavs, as they have yet to fill that position since LeBron James took his talents to South Beach in the summer of 2010. So here’s my approach as I try and figure out the Cavs new general manager and whether he’ll pick Parker or Wiggins. If I learned anything from the hiring of David Blatt, it was to go back and listen to the answers that David Griffin shared with us at his first press conference when he was officially named the team’s full-time G.M. Griff said they wanted to be different and weren’t going to follow what a lot of other teams were doing as they looked for their next head coach. He also mentioned that he was an offensive minded guy. Looking back on those responses now, it should have signaled to us all that the European version of Phil Jackson was going to be Griff’s choice, and soon the Cavaliers would be playing “BLATTsketball”. With that in mind I went back and listened to that May 13th press conference again to see if there were any signs or clues given by Griff as to which way he would lean if he was picking between Parker or Wiggins. Here’s what I came up with. Griffin, came right out and said “I believe in offense” and “I’ve had a primarily offensive based focus with the people that I was raised by”. Also, he said he wants the Cavaliers to be a better shooting team, a bigger team, a team that has a high basketball IQ and he’s looking for the right “Fit”. I’ve also added in what I’ve heard about David Blatt’s coaching style and how his offense is all about spreading the floor. Then I factored in that the Cavs already have two ball dominate guards in Kyrie Irving and Dion Waiters. So they’re probably looking for someone who doesn’t always need the ball in his hands to be effective. With all that information and based on the my scouting report of Wiggins and Parker, as well as other scouting reports I’ve read on the net, and people that I’ve talked to, it’s a very close call. But it sounds like to me that Jabari Parker would be the right “Fit Guy” for Griff and this Cavaliers roster. Parker is more skilled offensively. He shoots the ball better than Wiggins. Has a better handle than Wiggins. Parker is said to have a very high basketball IQ and he’s ready to play right now. He’s a “Plug and Play” guy at small forward from day one. The right “Fit”! I hope I’m wrong in my assessment based on David Griffin’s comments because I think Andrew Wiggins has the potential to be the better player based on his ability to play both ends of the floor as well as he freakish athleticism. 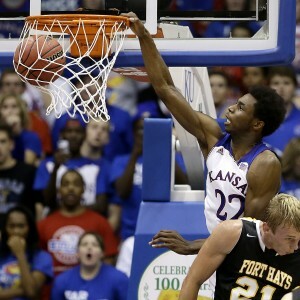 Wiggins would be my choice as the number #1 pick. But something tells me the player Griff is looking for in the draft. The player he was describing in that press conference, is Jabari Parker. We’ll find out Thursday night if I read David Griffin right, or if he did one hell of a job zigging again, when I thought he was going to zag. With Power Forward Dario Saric from Croatia reportedly about to sign a contract that will keep him in Turkey for at least the next two years, he drops in the rankings big time. 13 Cleanthony Early PF 6’8 – 220 – SR – Wichita St.
18 T.J. Warren SF/SG 6‘8 – 230 – SPH – North Carolina St.
20 Adreian Payne PF 6’10 – 240 – SR – Michigan St.
With Joel Embiid having foot surgery and now out 4 to 6 months along with some other information and conversations that I’ve had with people around the league, here is my updated Top 25 list of players for the 2014 NBA Draft. 16 Gary Harris SG 6’5 – 210- SPH – Michigan St.
21 Adreian Payne PF 6’10 – 240 – SR – Michigan St.
Joel Embiid was the pick in my fist mock draft, but that was before we knew about his right foot fracture. After missing badly last year on Anthony Bennett with the first overall pick the Cavs are in no position to gamble with Embiid’s foot and back issues so they take his teammate who is a freakish athlete with unbelievable potential. Wiggins is a two-way player from the get go, meaning he already knows how to play defense and his offense will only get better in the up tempo, open floor game of the NBA. He needs to be more consistent with his jumper, work on his handle and become more aggressive with the ball, but that should come with time, practice and maturity. He also fills a position of major need for the Cavaliers as they have been looking for a small forward since LeBron James took his talents to South Beach. Even with the Cavs taking Wiggins now with their first pick, they still need to improve their outside shooting as a team and if he’s still on the board they’ll grab Adams to help them from distance. WHAT DO THE CAVS DO NOW AFTER JOEL EMBIID’S FOOT INJURY? Last year the Cleveland Clinic played a major role in the Cavaliers passing on a pair of centers in the NBA Draft in Nerlens Noel and Alex Len. This year it looks like the Clinic has become a major factor again in helping determine who the Cavaliers will select with the 1st overall pick in 2014. Embiid’s consulting w/ orthopedist Dr. Richard Ferkel in L.A.; determination on fracture and possible surgery expected soon, sources tell Y. So with this information Cavs G.M. 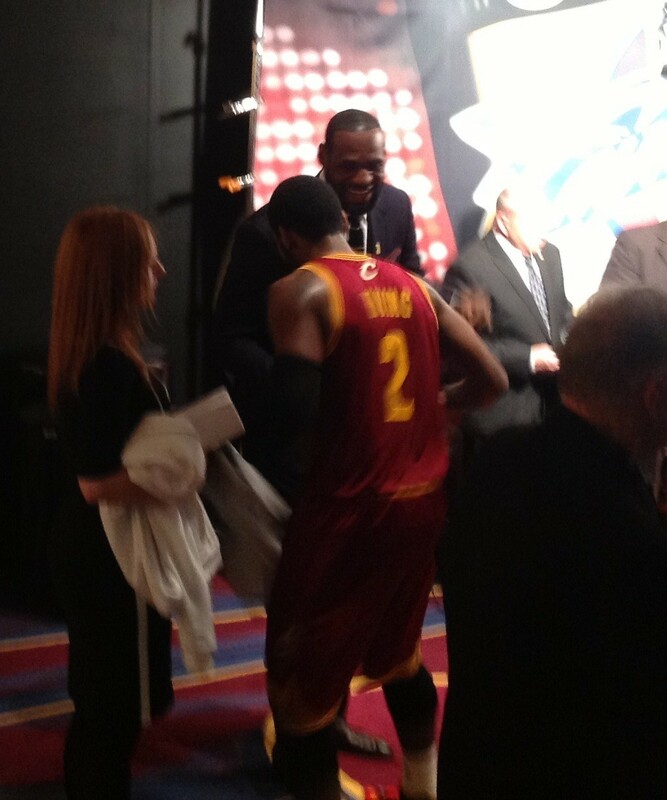 David Griffin probably has been reevaluating his potential decision as to who to take number #1 overall next Thursday. More than likely it comes down to two choices, small forwards Andrew Wiggins and Jabari Parker. While both one-and-done guys play the same position, they are two totally different types of players. The 6’8 – 200 pound Wiggins is considered a strong defensive player with a solid offensive game, that makes him the more complete all-around player with ridiculous athletic ability. His 44 inch vertical jump along with his 7-foot wingspan have GM’s throughout the league salivating. His ceiling is considered to be very high. His college coach Bill Self told me he feels that Wiggins offensive game will become more consistent because the NBA style of play suits Wiggins great athleticism, especially in the transition game. The other choice David Griffin has is Parker from Duke. He’s 6’9 but weighs 240 pounds, making his body more physically ready for the NBA competition and pounding. His offensive game is where he will earn his money. Inside and outside, back to the basket or facing up, Jabari Parker can shoot it and score the basketball. His offensive game is more complete and consistent than Wiggins and that’s why a lot of G.M.’s, scouts, coaches and media members feel he is more ready to play and will contribute to a team on offense right away. You hear the term “Plug and Play” with Parker a lot and that’s what will be expected of him where ever he ends up. The downside to Parker is his defense. His lateral movement and foot speed are of major concern to NBA front office folk on the defensive side of the ball. He may be too slow to guard the quicker, more athletic 3’s and not big enough to guard most power forwards. So you’ll have to give a little on defense to gain on offense. Could the Cavs still end up taking Embiid depending on the severity of his foot injury? Yes. But for a team who missed badly on number #1 overall pick Anthony Bennett last year and for a team who is desperate to make the playoffs, it’s unlikely they can take a chance with Embiid, but will instead pick between Wiggins and Parker. Either way they’re going get a potential all-star player who fills their biggest need at small forward. One is more ready to play right now in Parker. The other is the two-way player with more all-around upside in Wiggins. It’s time for David Griffin to make one of his many important off-season decisions. Good luck Griff! Writers note – This story was written before Joel Embiid suffered a right foot injury and it is being evaluated. 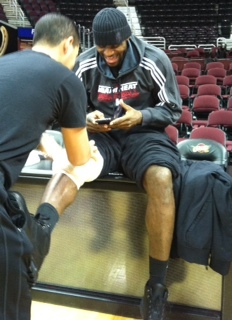 If the injury is serious, along with his recent back issues, it could change a lot in my plan to “Land LeBron”! If the Cavaliers are serious about trying to reunite with LeBron James and get him to return to Cleveland as a free agent this off season, there are a number of things they need to do before free agency starts on July 1st to even have a chance of making this happen. I’m not saying it will, I’m saying it would better their chances. First off, since they don’t have a Pat Riley or Phil Jackson in the front office they need to hire a coach who’s been a winner on the sidelines, played in the NBA and has some cache and a name. Right now none of their reported candidates have that combination. Tyronn Lue doesn’t. Neither does Alvin Gentry or David Blatt. While there is no proven, championship winning coach available out there, the closest thing to a coach who’s been successful on the sidelines, has played the game and has some “street cred” to go along with his game smarts is Mark Jackson. That move I believe would get LeBron’s attention while he is on vacation with his family and thinking about his future. Problem is, according to a story I read from the News-Herald/Morning Journal’s Bob Finnan today, he had a quote from Jackson in the article saying that reports that the Cavs have contacted him are, “Nothing but rumors and speculation.” If that indeed is the case, and G.M. David Griffin has said they will leave no stone unturned as they search for their next head coach, you have to ask yourself why haven’t the Cavs contacted Mark Jackson? What are they waiting for, especially if they are thinking about trying to lure LBJ back to C’Town? Secondly, if you’re not going to make a major trade for Kevin Love, and the only way I do that if I’m the Cavs is if I get Love to sign a contract extension, then you draft center Joel Embiid. Now granted, you have to feel confident that after putting him through all of your medical tests that his back is fine, but if it is, then you go get the “Big” out of Kansas. Embiid has a ton of upside, and while right now he’s still a little raw on offense, he reportedly impressed the Cavs in his work out by showing off his great foot work and the ability to shoot the basketball from some distance, along with a nice touch around the rim. While his offense is a work in progress and there is evidence there that it will develop, he can make his presence felt in his rookie season with his defense and rebounding. Right away he gives the Cavs a much needed rim protector in blocking shots and altering others. Plus his rebounding would allow the Cavs to get out and run more and get easy baskets in transition. 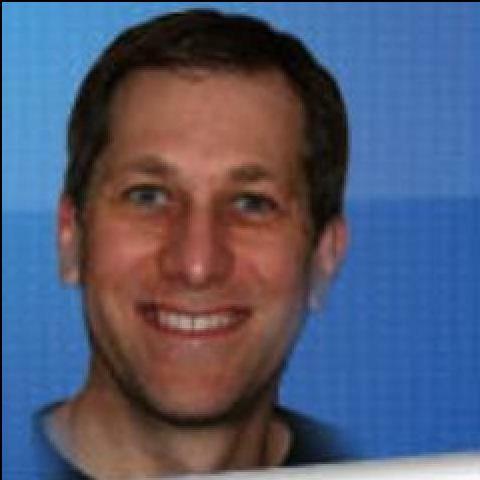 So if Jackson ended up being your coach and Embiid was the choice as the first overall pick in the draft, you would have your coach who’s got some swag to go along with his winning record in the NBA as your bench boss and you’d have a young legitimate center with a lot of potential and the ability to patrol the paint. On top of that you’d have a fourth year all-star point guard in Kyrie Irving, a third year shooting guard in Dion Waiters, plus some cap space and maneuverability to fill some other spots on your roster through trade or free agency. There have been some reports out there that LeBron and Kyrie don’t get along that well any more, or that James doesn’t want to play with a ball dominate point guard. I say that’s hogwash. After seeing how a lack of point guard play killed the Heat in the NBA Finals against San Antonio this year, I believe LBJ understands the importance of having a top notch point guard in today’s game and would sacrifice being in control of the offense the majority of the time if it meant more wins and less minutes for him as he gets older. While none of what I just wrote would guarantee that LeBron James will decide to opt out of his contract in Miami and come back to Cleveland this off season as a free agent, I believe if the Cavs are serious about bringing James home again, it has to start there. If LeBron is not in their plans, then they can consider hiring a Tyronn Lue or a David Blatt as their inexperienced head coach and fill the small forward hole on their roster by picking either Andrew Wiggins or Jabari Parker and continue to build for the future with a young squad growing together over time. But if the Cavaliers want to try and lure LeBron back and win right away, bold moves and chances have to be taken by Dan Gilbert and David Griffin, and hiring Jackson and drafting Embiid would be the place to start! When NBA General Managers put a file together on a player they are thinking about selecting in the NBA Draft, they’re looking for any numbers and information that may help them get an edge over their fellow G.M.’s. With that in mind, one of the things I look at, and they may look at is, how efficient is a player when he shoots the ball from the field, from 3-point range and the free throw line. So I take the different shooting categories and add their percentages together to create an overall shooting efficiency number. Below are two lists. The first is field goal percentage, plus 3-point percentage, plus free throw percentage. The second list is field goal percentage plus free throw percentage.